Three CAD drawings; stamping, reroughing and miling. LEAP Australia (Stand 1802) will display its comprehensive range of products to support computer aided engineering processes including CAD, CAM, FEA, CFD and data management software. A focus of the stand will be the suite of ANSYS mechanical simulation software used to assess mechanical performance of components, assemblies and mechanisms. ANSYS software is suitable for application in aerospace, automotive, maritime, rolling stock, agricultural equipment, electronics and consumer products manufacturing. Also available will be information on the Pro/ENGINEER Wildfire CAD/CAM/CAE software. 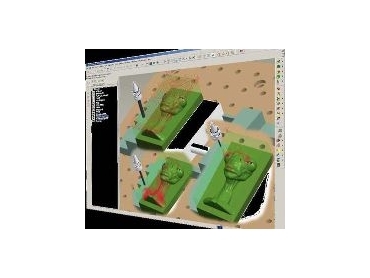 Manufactured by Parametric Technology Corporation, the software is regarded as one of the most powerful, fully featured and integrated programs available. These products will be complemented by information on Fluent Computational Fluid Dynamics (CFD) software; Alibre Design CAD software; and Rhinoceros, Flamingo and Penguin from Robert McNeel & Associates. The company has broadened their services to enable efficient product development, manufacturing and management of the whole design process.